He was very wild, and didn't like me one bit. Little scary, but really interesting! Awesome! I'm in the US. Northern Ohio. That there is the reason I don't understand Americans who skinnydip! I would not mind raising one of these captive bred hatchlings. They are so cute and they grow into these dinosour looking animal. Simply awesome. I think they are stunning creatures, them and leeches . cvanvollenstee wrote: I would not mind raising one of these captive bred hatchlings. They are so cute and they grow into these dinosour looking animal. Simply awesome. The hatchlings are very personable, and I have seen very tame large adults. This one was VERY bitey, in the second pic, he's in a typical agressive stance, ready to strike. They can extend their neck a seemingly impossible length, and at the same time, launch themselves forward using those huge legs and tail. I really wouldn't want to get bit. I took him to a local river for release since I really didn't want him in my pond, plus my neighbor eats 'em. cvanvollenstee wrote: plus my neighbor eats 'em. Wow I wonder how old he was. I have been told the females do not leave the ponds and only the males move around. Tricky to handle them I guess. Is it legal to eat them? Poison a road killed one and give that to your neighbour. If he get sick or even dies then thats just so sad. Might be a deterrent to others to leave them alone. It was looking for your cat. I must be honest, that is not a pretty creature, but thanks for sharing. 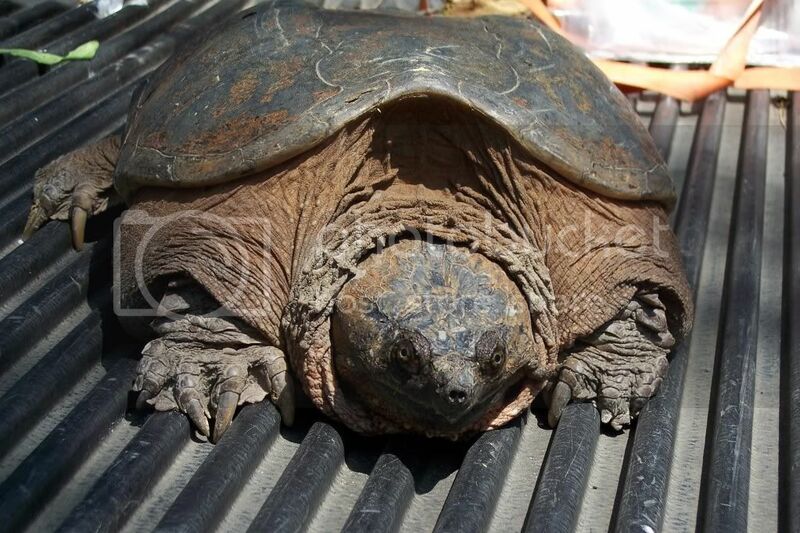 Yes, this is a Common Snapper (Chelydra serpentina)widespread in about 1/2 of US, and southern Canada. 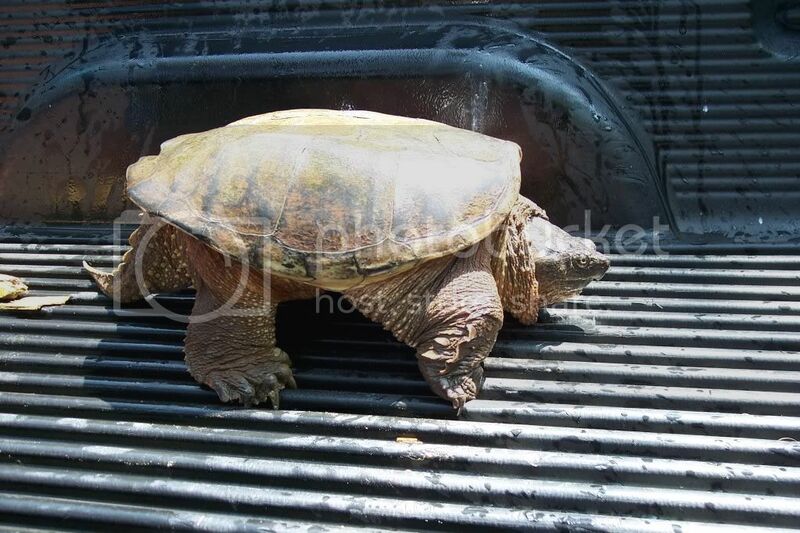 Alligator snappers are mainly in the Southeast US. There are also Florida snappers, and a couple of South american species. When they get to this size, they're difficult to carry around, especially if they are trying to seperate you from a couple of fingers.They can stretch their necks backwards to about halfway on their shells.I have to admit that I wasn't real comfortable with this guy. In May and early June around here is Springtoime, and they seem to move around from place to place. Bushviper wrote: Wow I wonder how old he was. I have been told the females do not leave the ponds and only the males move around. Tricky to handle them I guess. In Ohio, thay're legal to kill with a fishing lisense. Most of the turtle eaters are in the southern US. My neighbor, who thinks they're a delicacy, has given me eggs that he's found on a couple occasions while dressing them, which sucessfully hatched.